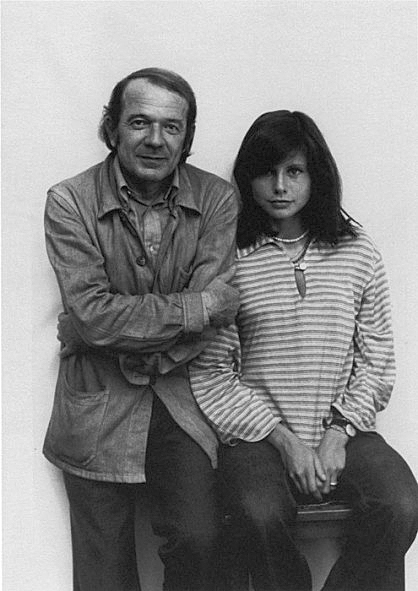 I found this portrait of French philosopher Gilles Deleuze and journalist Claire Parnet over on Graham Harman's blog. I don't know much about Deleuze or Parnet, but I find the portrait striking for a couple of reasons. First, both of their faces express a genuine connection and presence with the photographer, but each in a different way. As all portrait photographers know, the best portraits capture a genuine expression of the subject and that this is very difficult to achieve. This photographer has done well (I cannot track down who the photographer was). Second, their bodies are so different. Deleuze's facial expression communicates a comfort with the photographer and camera, but his body position communicates the opposite. His arms are crossed tightly around his body, drawing his jacket in around his waist. His body looks tense, in spite of how relaxed and gentle his face appears. Conversely, Parnet's arms and legs are in an open and relaxed gesture while her facial expression appears earnest and actively engaged with the camera. Her torso is erect. She seems to be pressing her back and shoulder against the wall. Deleuze's back is slightly arched forward. Parnet interviewed Deleuze at length about his philosophy, you can read their collaboration here and here, and watch DVDs of the interviews here.